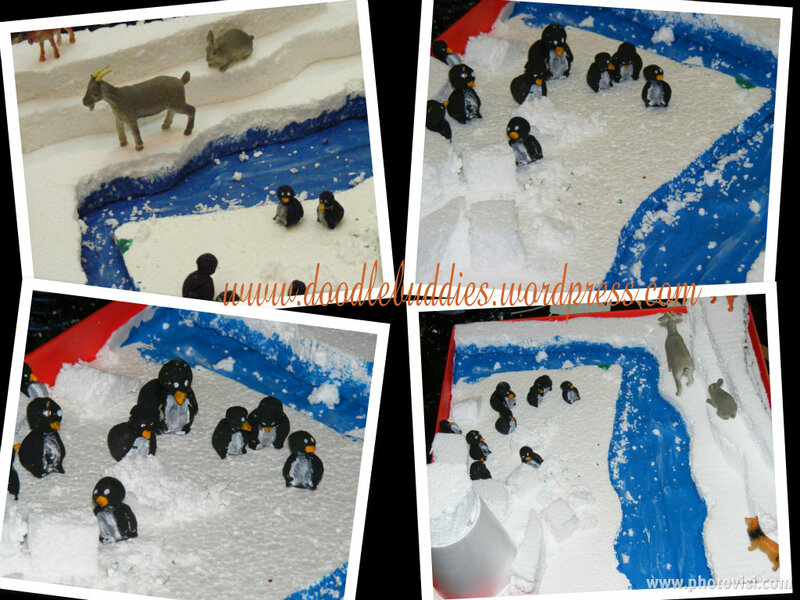 Diorama Project for Artic Circle. 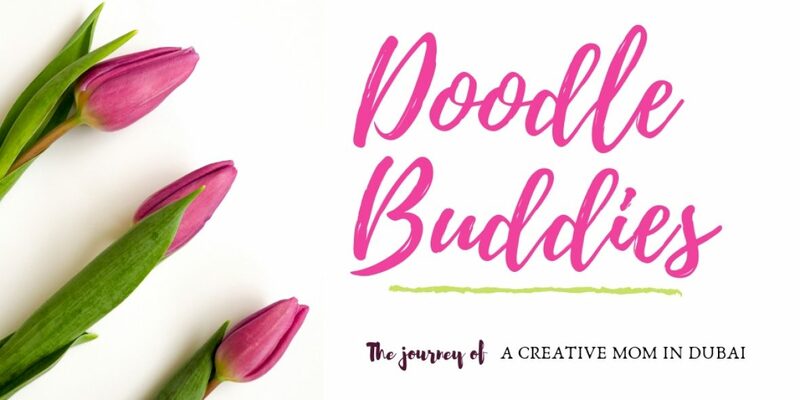 One of the biggest advantages of having a creative Mom, is you never have to worry about inspiration for a project. Although, I generally like for the boys to execute the project, I like to give them a brief idea for what would look appealling and informative. 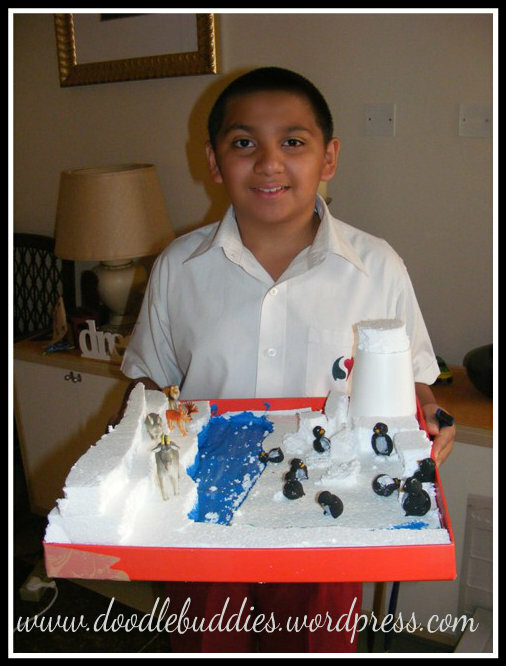 Eman the youngest, has an artic project where he has to produce a landscape as well as an ecosystem. It was meant to be a three dimensional project and I completly and absolutely loved working on this project. 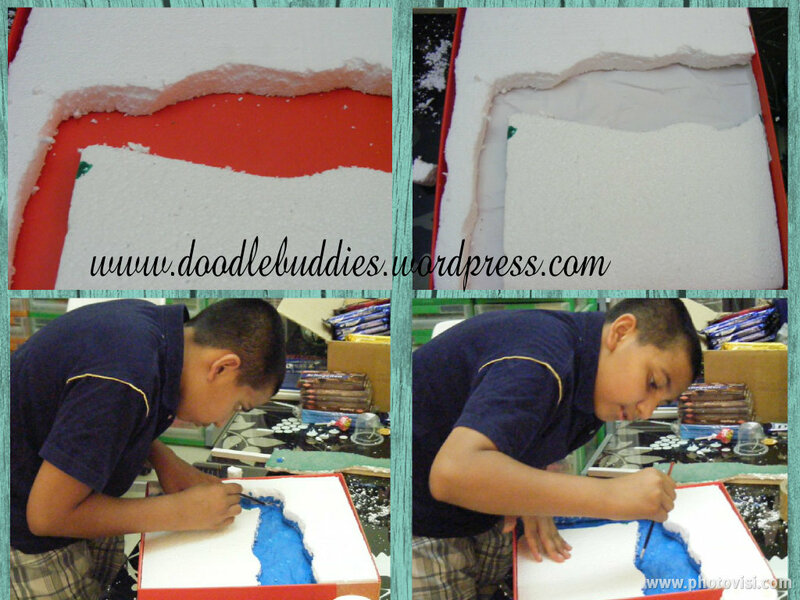 Playing with styrofoam can be fun but a challenge becoz its so darn messy. But the results are always stunning. We layered two different sizes of styrofoam on the lid of one of my large boxes for variation in landscape, and placed a thick white crumpled paper bag between the ridge of the styroform to give the look of a flowing river. Eman painted it thick acrylic blue with streaks of white in between to show movement. 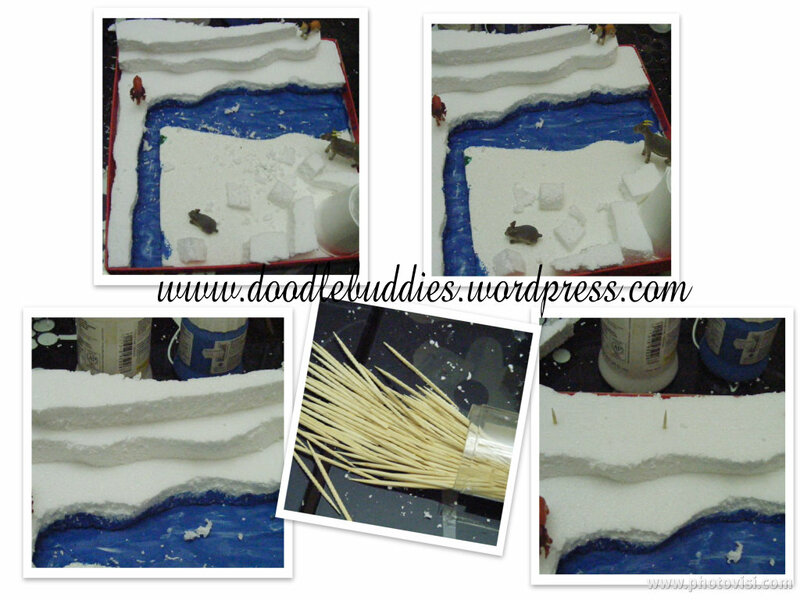 Another 2 stripes of styrofoam were pinned with toothpicks to built the mountains. You really cant work with glue on styrofoam and for a project which demanded so much glue, I wasnt going to use my E6000, so we happily placed tooth picks and that did the job perfectly well. A koka noodles cup was stood in the corner to form a small hill with chunky pieces of styrofoam scattered randomly. Eman already had a couple of artic animals like the artic hare, fox, moose etc so all we needed now were some penguins. I will post in another post how we made Penguins, but some salt dough made excellent penguins. The whole process took just over 2-3 hours including coloring and baking time and one super happy young boy ! I have directed the pictures in a way, that is a self tutorial. Please feel free to use the process. 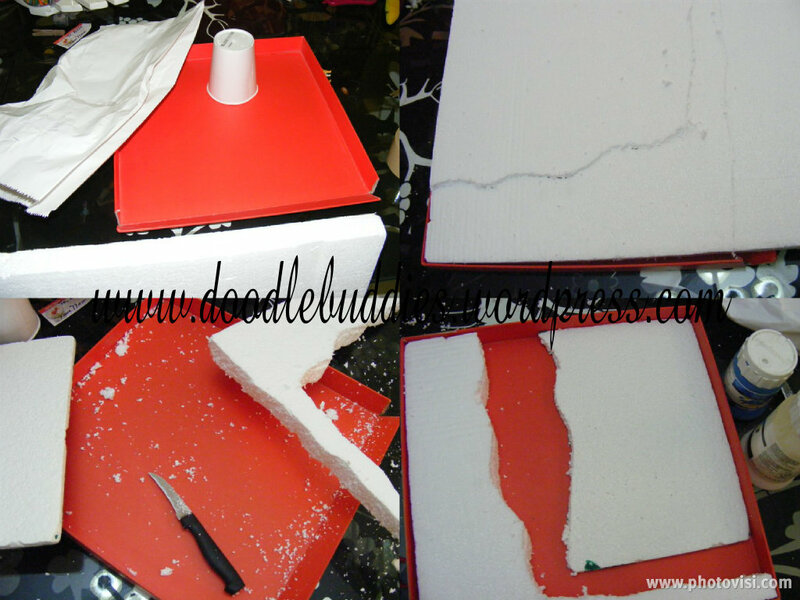 It is alot of fun, but I would certainly suggest, working with styrofoam outdoors as I learnt my lesson the hardway ! 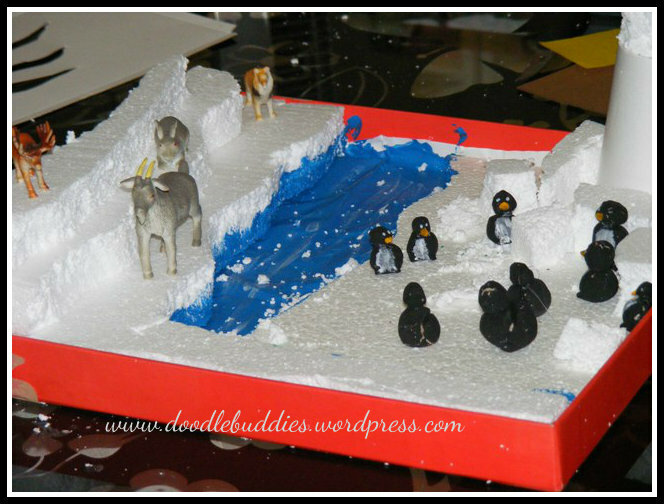 I hope you enjoyed the transformation from box lid to an artic landscape. If you have felt inspired to try something similar, I would love if you could also sent me pics of the same too. Thank you for visiting me today. Hope you return again.